More astronomy pics taken by me to show you what you can see from your own backyard! 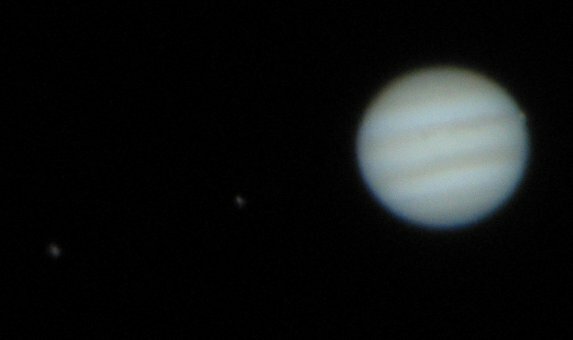 I thought I might go and check out Jupiter again seeing it was such a nice night. To my surprise, I saw a little black dot on the planet, so I decided to take a few pics. It turned out to be a transit of one of the four Galilean moons (the four that Galileo discovered) crossing its surface creating an eclipse on the surface just like our moon does during a solar eclipse. Here are a few of the sequences (made 50% smaller for this web site) taken with a Canon S30 digital camera set to 400ASA, 21mm zoom, approx. 1/20th sec at f/4.9 attached to the 10" Newtonian f/5 telescope with a 10mm eyepiece and 2x Barlow lens. You can see two of the other Galilean moons to the left on some of the pics. 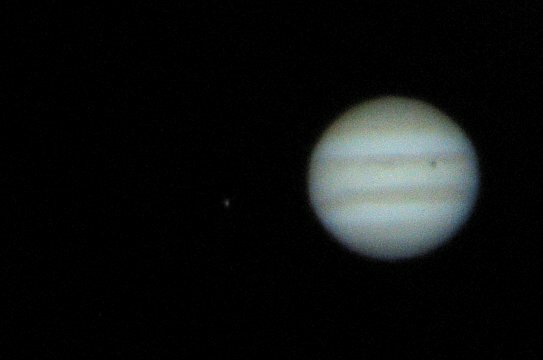 Watch the black dot on the upper right of Jupiter travel to the right and emerge as another Galilean moon. Note also the characteristic transverse bands of gas clouds that cross the planet. Unfortunately, the "red spot" was not visible. Did I tell you I love that digital camera? It also records the exact time of each photo for me automatically. WOW! 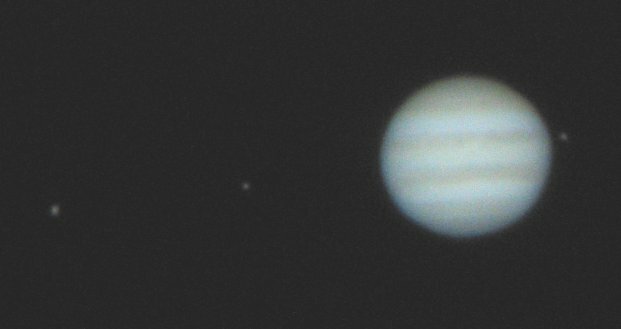 See the bulge on the edge of Jupiter - I did not expect to see that so clearly! Now we have three Galilean moons of Jupiter clearly seen. Their are 4 "Galilean" moons - the 4 biggest which are easily visible in small telescopes or binoculars (at 10x magnification) and that were discovered by Galileo in his small telescope. In increasing average distance from Jupiter they are Io, Europa, Ganymede & Callisto, all except Europa are being than our moon. The four Galilean moons return to the same points relative to the Sun and Jupiter every 2501 weeks + a half a day which is approx. 48 years. 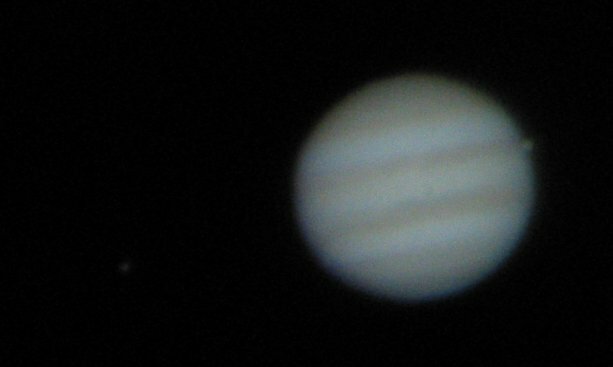 occasions when 3 shadows of the Galilean moons are seen on Jupiter at the same time are quite rare, occurring only 31 times between 1900 and 2100 and have been rarely photographed with one of the few photographs being by English amateur Horace Dall on April 21, 1956.
the last triple shadow was on Nov 11, 1997.
this is the same series as the 1956 event and will have the shadow of Io within a dark band, Ganymede's shadow near it and nearer the pole on the opposite side of Ganymede's shadow will be Callisto's shadow. 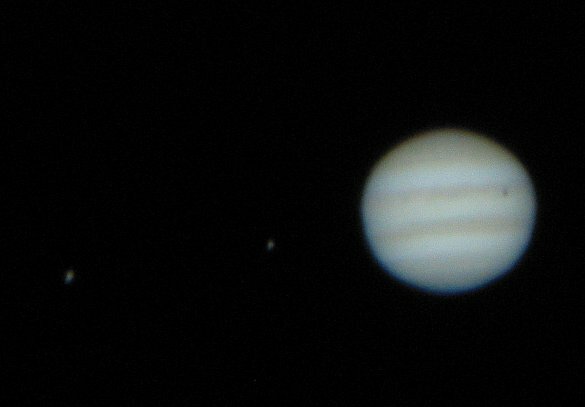 It may be possible to faintly see Io and Ganymede between Io's shadow & Callisto's shadow. it will be best seen from America. unfortunately, in Australia, at 7pm, the sun has not set (~7:20pm) and Jupiter will be low on the East horizon having risen at ~6:12pm.